coated tablet. Pink biconvex tablets 5.5 mm diameter. 4. CLINICAL PARTICULARS 4.1 Target species Cats. 4.2 Indications for use, specifying the target species For the stabilisation of hyperthyroidism in cats prior to surgical thyroidectomy. thyroid products. If allergic symptoms develop, such as a skin rash, swelling of the face, lips or eyes or difficulty in breathing, you should seek medical attention immediately and show the package leaflet or label to the doctor. Do not break or crush tablets. nuclear antibodies),and, very rarely, Revised: April 2017 AN: 01367/2016 Page 3 of 6 lymphadenopathy can occur. Treatment should be stopped immediately and alternative therapy considered following a suitable period for recovery. term treatment with thiamazole in rodents, an increased risk of neoplasia in the thyroid gland has been shown to occur, but no evidence is available in cats. 4.7 Use during pregnancy, lactation or lay Laboratory studies in rats and mice have shown evidence of teratogenic and embryotoxic effects of thiamazole. The safety of the product was not assessed in pregnant or lactating cats. Do not use in pregnant or lactating females . 4.8 Interaction with other medicinal products and other forms of interaction Concurrent treatment with phenobarbital may reduce the clinical efficacy of thiamazole. Thiamazole is known to reduce the hepatic oxidation of benzimidazole wormers and may le ad to increases in their plasma concentrations when given concurrently. Thiamazole is immunomodulatory, therefore this should be taken into account when considering vaccination programmes. 4.9 Amounts to be administered and administration route For oral a dministration only. 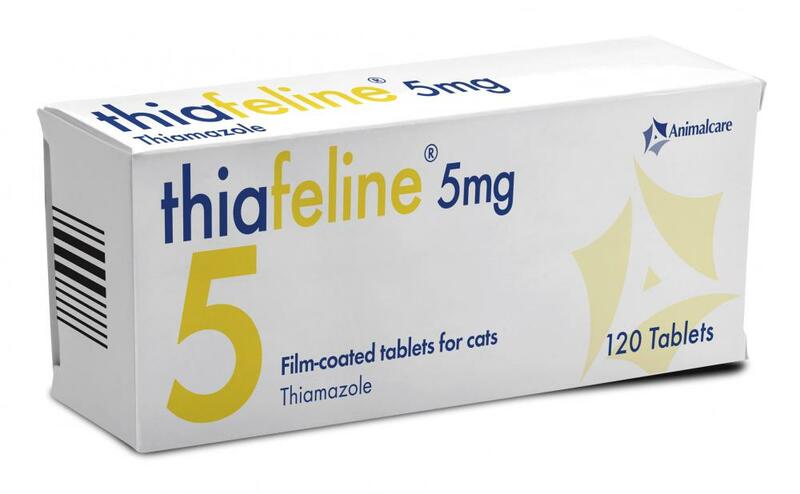 For the stabilisation of feline hyperthyroidism prior to surgical thyroidectomy and for the long term treatment of feline hyperthyroidism, the recommended starting dose is 5 mg per day. Wherever possible, the total daily dose should be divided into two and administered morning and evening. Tablets should not be split. If, for reasons of compliance, once daily dosing with a 5 mg tablet is preferable, then this is acceptable although the 2.5 mg tablet given twice daily may be more efficacious in the short term. The 5 mg tablet is also suitable for cats requiring higher dose rates. containing imidazole derivates. ATC Vet Code: QH03BB02. 5.1 Pharmacodynamic properties Thiamazole acts by blocking the biosynthesis of thyroid hormone in vivo . The primary action is to inhibit binding of iodide to the enzyme thyroid peroxidase, thereby preventing the catalysed iodination of thyroglobulin and T 3 and T 4 synthesis. 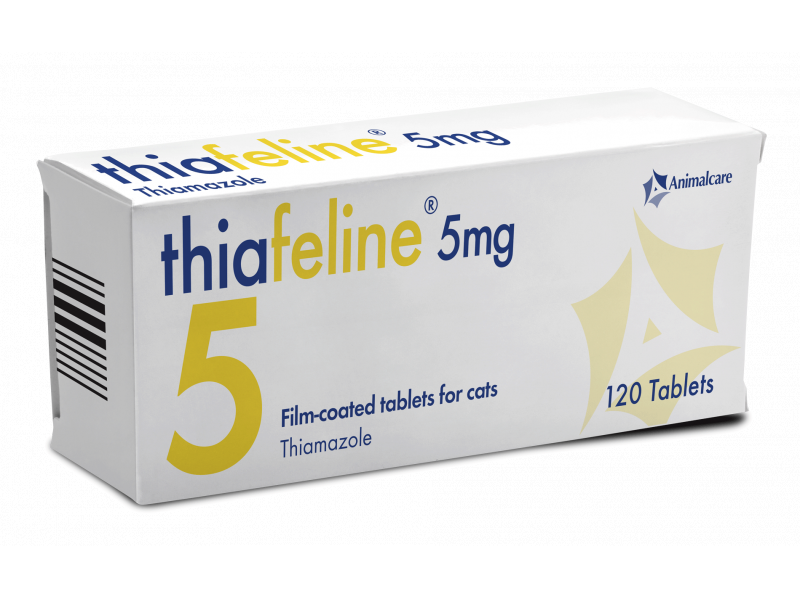 5.2 Pharmac okinetic particulars Absorption Following oral dosing in healthy cats, thiamazole is rapidly and completely absorbed with a bioavailability of >75 %. However, there is a considerable variation between animals. Statement of the active substances and other ingredients Description: Each orange film-coated, biconvex tablet (5.5mm diameter) contains thiamazole 5mg. Indications For the stabilisation of hyperthyroidism in cats prior to surgical thyroidectomy. For the long-term treatment of feline hyperthyroidism. Contraindications Do not use in cats suffering from systemic disease such as primary liver disease or diabetes mellitus. Do not use in cats showing signs of autoimmune disease. Do not use in animals with disorders of white blood cells, such as neutropenia and lymphopenia. Do not use in animals with platelet disorders and coagulopathies (particularly thrombocytopenia). Do not use in pregnant or lactating females. Do not use in cats with hypersensitivity to thiamazole or the excipient, polyethylene glycol. Adverse reactions Adverse reactions have been reported following long term control of hyperthyroidism. In many cases signs may be mild and transitory and not a reason for withdrawal of treatment. The more serious effects are mainly reversible when medication is stopped. Adverse reactions are uncommon. The most common clinical side effects reported include, inappetance/anorexia, lethargy, severe pruritus and excoriations of the head and neck, bleeding diathesis and icterus associated with hepatopathy, and haematological abnormalities (eosinophilia, lymphocytosis, neutropenia, lymphopenia, slight leucopenia, agranulocytosis, thrombocytopenia or haemolytic anaemia). These side effects resolved within 7-45 days after cessation of thiamazole therapy. Possible immunological side effects include anaemia, with rare side effects including thrombocytopenia and serum anti-nuclear antibodies, and, very rarely, lymphadenopathy can occur. Treatment should be stopped immediately and alternative therapy considered following a suitable period for recovery. Following long-term treatment with thiamazole in rodents, an increased risk of neoplasia in the thyroid gland has been shown to occur, but no evidence is available in cats. Target species Cats Dosage for each species, route and method of administration Administration route Oral. Amounts to be administered For the stabilisation of feline hyperthyroidism prior to surgical thyroidectomy and for the long term treatment of feline hyperthyroidism, the recommended starting dose is 5mg per day. Wherever possible, the total daily dose should be divided into two and administered morning and evening. Tablets should not be split. If, for reasons of compliance, once daily dosing with a 5mg tablet is preferable, then this is acceptable although the 2.5mg tablet given twice daily may be more efficacious in the short term. The 5mg tablet is also suitable for cats requiring higher dose rates. There are currently no questions for Thiafeline - be the first to ask one!